It seems like Sheila has done every job there has been at St Mary’s in the last 63 years, from cleaner to churchwarden. Since 1953 she has welcome eight vicars and seen the building transformed. She is still a Prayer Co-ordinator, our Electoral Roll Officer and the Tote organiser. Over the years she has attended innumerable prayer groups and Bible study groups. She has taken her turn at coffee-making, flower-arranging, door welcomer, lesson reader …… the list could go on. She has been just as busy outside St Mary’s as a School Governor, a Brown Owl in the Guiding Movement for 20 years and a Hospital Visitor for 45 years, (most recently as a supporting member of the Chaplaincy Team). 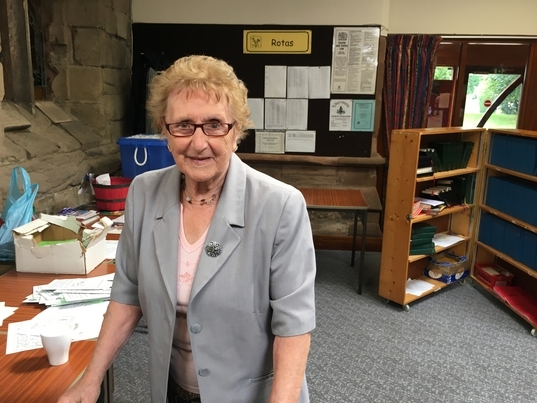 Like other members of our congregation, she has helped at the Tuesday Luncheon Club in the local Baptist Church and for 22 years has found time to join Meredith Road Baptists for their Thursday service. Sheila would say there are other people like her who do lots of jobs, but perhaps she is the best example of someone who has contributed greatly to our community by her consistent commitment to one place. 10.45 am. Price £1. Tea, Coffee, biscuits. CREW (Creative, Ready, Equipped & Willing) a children's activity and worship group.